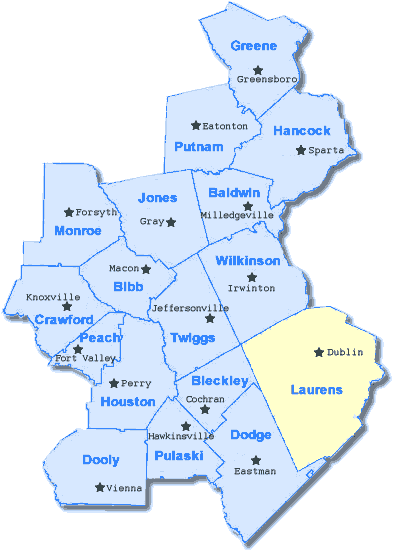 Laurens County, founded in 1807 and the fourth largest Georgia county based on land size, is also referred to as the Emerald City. Once a lawless community in the 1880's Dublin transformed itself with the coming of the railroads. The county was devastated after World War I and turned to depend on the production of cotton. This ended with the boll weevil and the flu epidemic of 1918. Today, Dublin-Laurens County is distinctly known for its rich southern hospitality and has been described as a great place to work, live and retire. Dublin is home to the month long St. Patrick's family celebration. Strategically located in the heart of Georgia on I-16, its central location provides excellent transportation to both Atlanta, Hartsfield Airport and Savannah. Are you relocating to Dublin Georgia? Get your FREE relocation package!